Make your holidays bright this year with special family ornaments to commemorate the occasion. Frederick Engraving would be delighted to hand craft you a custom ornament to celebrate your family this year. Our personalized ornament range includes laser cut wood, engraved wood, and engraved lucite. Whatever option you choose, you can look back on this year’s holidays in future years with a commemorative piece. Your child can also express herself with thoughtful personalized ornaments for parents and grandparents. Grandmothers and grandfathers can receive custom pieces from a single grandchild or the whole family. Grandparents love to show off their grandchildren, and what better way than decorating the tree with these lovely gifts from the children themselves? 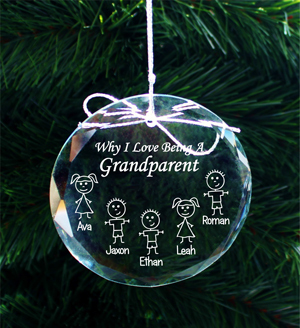 Grandparents can also gift their grandchildren with custom family ornaments with each child’s name and an engraved likeness. Choose a personalized ornament crafted in wood for a rustic, natural look, or choose lucite for a more crisp and modern appearance. Engraved or laser cut name ornaments are also available. Kids love having personalized items with their name or nickname on them. Give them a personalized ornament and a place of honor to hand it on the tree every year. It is sure to be a hit. Frederick Engraving crafts personalized ornaments and other keepsakes with pride in our workshop. We don’t just offer thoughtful family ornaments to decorate your tree, but a wide range of gifts to place under the tree. We offer gifts and keepsakes for every occasion, from picture frames to pint glasses. Our capabilities include laser cutting, etching, engraving, and color printing. When the thought truly does count, choose Frederick engraving.